Breakfast is a serious business in our family and we don’t skip it. 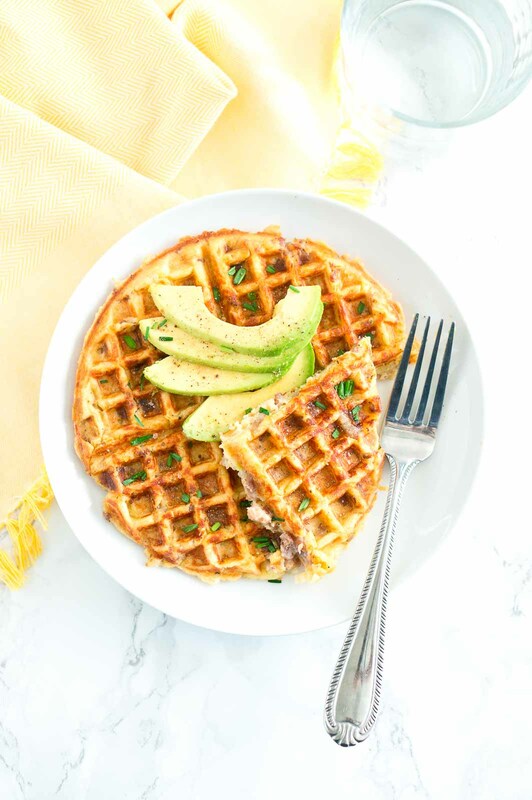 Recently, I made these sausage and potato waffles – they are a fun new spin off the classic waffles. Crispy on the outside and soft on the inside. Delicious, savory and an easy breakfast idea! 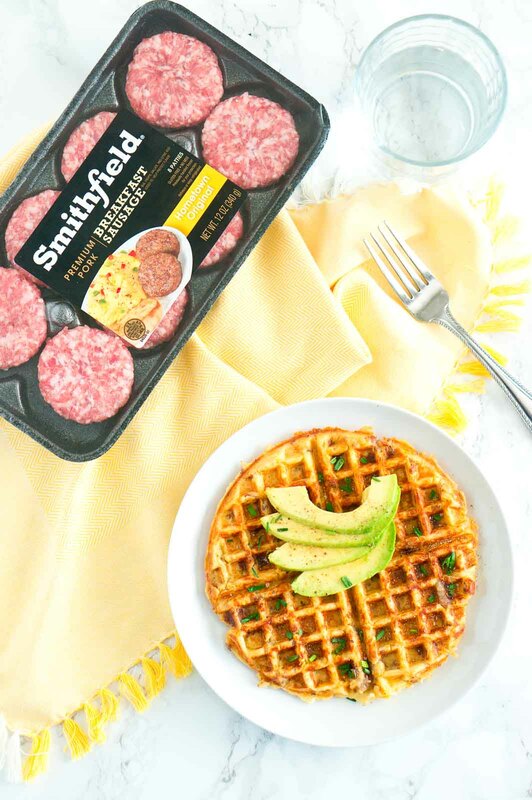 Just wanted you to know that your newest favorite breakfast, these delicious sausage and potato waffles, are sponsored by my friends over at Smithfield! I try to create delicious and nourishing breakfasts every week. Even though our schedules are very busy and our day starts at dawn, we try not to skip breakfast. It’s the most important meal of the day – it boosts energy, increases concentration and gets you through those morning hours. By starting your day with a protein-packed breakfast, you are more likely to be efficient and effective throughout the day. 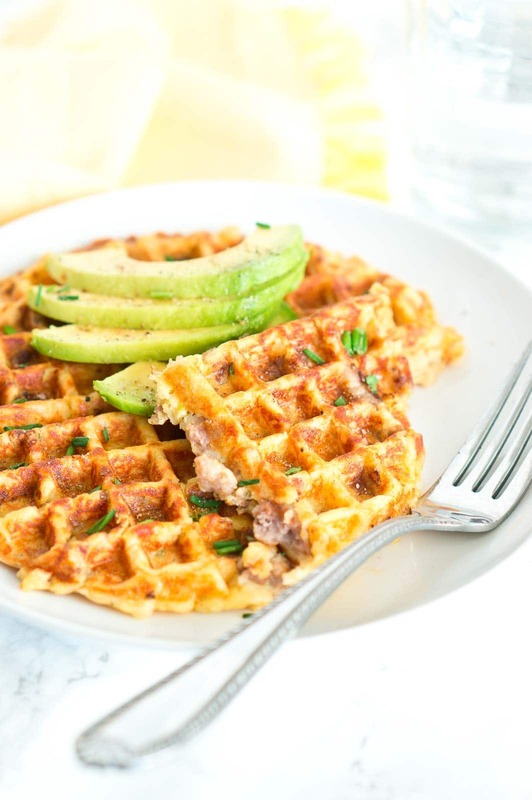 These sausage and potato waffles are simple and convenient, yet hearty and wholesome. They are perfect for those rushed mornings when you need a quick breakfast – they are easier to make than you think. Just brown the sausage, mix it with mashed potatoes, eggs and flour, and cook the mixture in the waffle maker for about 3 minutes. All you need is just a few minutes for delicious and filling waffles. Add baking powder to the potato mixture for fluffy and light waffles. Use eggs and flour for best consistency of the waffles. Spray preheated waffle iron with a cooking spray to ensure the waffle slides right out. Spray cooking spray between waffles as needed. Preheat the waffle iron for about 5 minutes and make sure it’s hot. This will ensure that the waffles are crispy on the outside and tender on the inside. Cook waffles at a medium-low setting for about 3 minutes so you don’t burn the waffles. 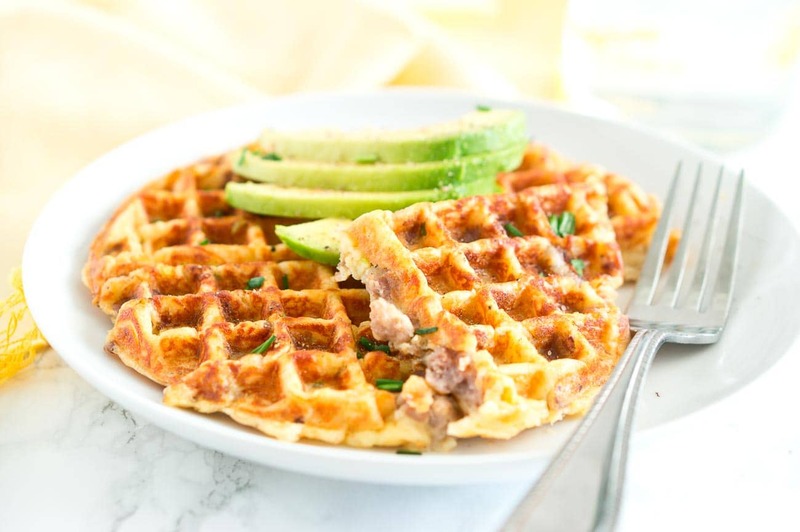 Using my waffle iron is a huge time saver when I need to make breakfast quickly. I love that I can make the sausage and potato waffles on Sunday evening and have breakfast for a couple of days during the week. It’s easy, quick and absolutely delicious! Using Smithfield fresh breakfast sausage makes it even easier to serve a quick and delicious breakfast on the table. Their breakfast sausage is a quality product that is convenient, versatile, and easy-to-use. I love that they have a variety of breakfast products to choose from and add to my breakfast rotation – the Smithfield breakfast products include several flavors and cuts of bacon, fresh breakfast sausage, and ham. They are a perfect solution if you want to create delicious protein-packed and flavorful breakfasts. The fresh breakfast sausage is a convenient and delicious addition to any breakfast and available in a variety of flavors including Maple, Bacon and Hometown Original. I love to visit Smithfield’s website for breakfast inspiration and more quick and easy breakfast recipe ideas. You can join Smithfield in their partnership with No Kid Hungry, an organization committed to providing innovative solutions to combat childhood hunger, to donate one million meals* to children in communities across America. Purchase Smithfield breakfast products up until October 31st and help Smithfield and No Kid Hungry reach their goal! For every purchase, Smithfield will donate enough for one meal to No Kid Hungry! When you post a picture of your Smithfield breakfast** to your social channels (Facebook, Twitter, and Instagram) and tag it #BreakfastPower, Smithfield will donate a second breakfast to No Kid Hungry! Sausage and potato waffles - a new spin on the classic waffles. Crispy on the outside and soft on the inside. Delicious, savory and easy breakfast idea! Mix cooked sausage, mashed potatoes, eggs, flour, baking powder, salt, black pepper, and chives in a large mixing bowl until well combined. The mixture will be very thick. Spray waffle iron with olive oil spray and preheat it on medium low. When hot and ready, spread the mixture in the waffle maker, close the lid, and cook for about 3 minutes. Serve warm and top with avocado slices. 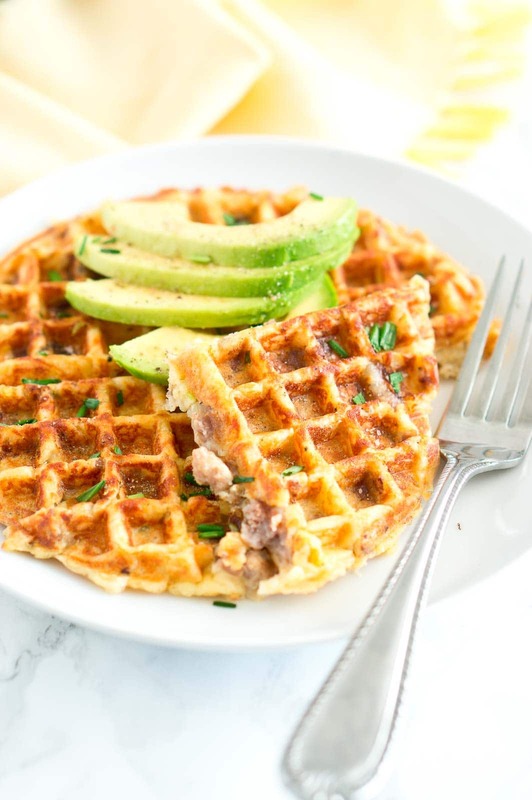 I always see savory waffles and am very intrigued! It’s almost like potato pancakes, just a different shape really. They sound delicious and although I don’t eat meat, I could totally do these with veggie sausage! Yes, they are very much like potato pancakes. Absolutely delicious! Oh man, I need to get myself a waffle iron! These look epic! YUM! Thanks, Elizabeth!! 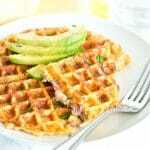 I love my waffle iron – always great breakfast and super easy! This looks so yummy. I would love this for breakfast tomorrow. Pinning! I’m always looking for new savory breakfast ideas. These look perfect! Can’t wait to try them! I love a good savory waffle!! These look great! Looks amazing!! Love these waffles!!! I love this idea! Can’t wait to try this recipe! Hope you enjoy it, Carolyn! These waffles look good! I love Smithfield’s ham. I will have to look for their sausage patties. 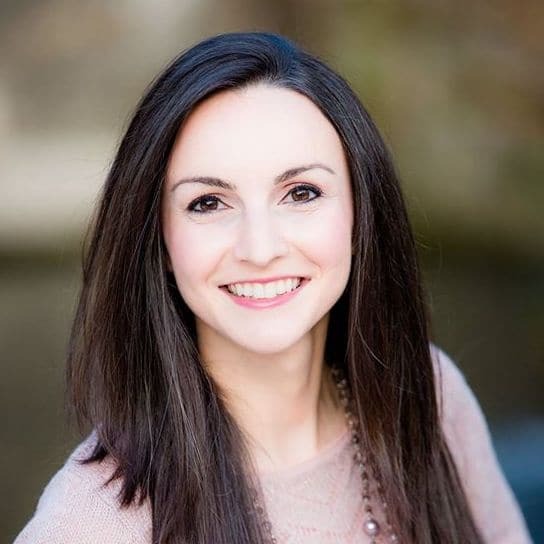 Thanks, Tiffany~ you will love their sausage patties – they are so delicious! These look great – I need to pull out my waffle iron more! Thanks, Kate! Hope you give them a try! They are so good! What a great idea to mix the sausages in. The kids will love this! Yes, I am sure they will! When referring to mashed potatoes in the States, we mean cooked potatoes that are mashed. I love your savory take on waffles. Breakfast will never be the same! Why gluten free flour? Can you use regular? I resist buying special ingredients for just one recipe. yes, absolutely! You can use regular flour. It’s just a personal preference but it works perfectly with regular flour.